Two leading figures from the world of modern progressive rock came together last year to record an intriguing album. "Not The Weapon But The Hand" ploughed a similar furrow to later Marillion and the more plaintive efforts by '80s synth-glam pop icons Japan, which is not surprising - Steve Hogarth and Richard Barbieri have respectively been fully paid up members of both bands at some point in their careers. 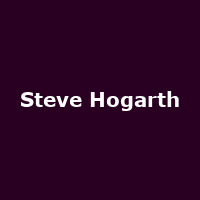 Hogarth's history continues with Marillion to this day of course, but previously he fronted The Europeans before working on albums by Julian Cope, The The, Dream Theater and his own occasional 'h' and solo projects. Barbieri's career with Japan lasted as long as the band - after splitting in 1981, Richard busied himself with numerous ambient and pop projects, particularly with David Sylvian's brother Steve Jansen as The Dolphin Brothers and their own monikers. His most steady job has been as a regular keyboardist with Porcupine Tree since 1993, but in 2012 hooked up with Hogarth, plus XTC's guitarist Dave Gregory and double-bass wizard Danny Thompson, to complete "Not The Weapon...". Later this year, both Hogarth and Barbieri will raid their respective catalogues for a European tour during which they'll perform new songs as well. Included are UK dates in September, such as Manchester on the 11th and London on the 12th with more shows a distinct possibility. Tickets for both shows are on sale now, priced at £20/£22.